We offer wide range of Braided Hose for numerous industrial applications. Braiding of Wires directly over the Hose or conduit allows very tight winding and higher pressure ratings. Stainless Steel Grade SS304 and Galvanized Steel are available as standard. We offer Braided Wire and Flexible Braids which are used as Expandable Wire Sleeves. They are perfect choice for protection of Stainless Steel, Hydraulic and rubber hoses. Expandable Wire Sleeve is also used to protect Flexible Wiring Conduits. 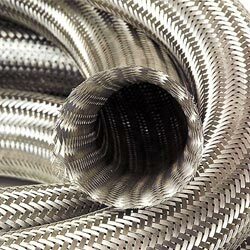 Use of wire sleeves (as compared to direct winding over the hose or conduit) is often preferred where quantity is small and lead time is short. Stainless Steel Grade SS304 and Galvanized Steel are available as standard. Other Grades are also available upon request.